There's a mom celebration going on that I heard about via the Parent Blogger Network. It's a little something called Portraits of Mom. There's photo sharing going on and of course, prizes. And if you're in San Francisco or Brooklyn, you can even waltz into a Windows Live studio to get a free portrait with your kids which is something all of us photo moms could really use (as we're never in the photos because we're always taking them). Be sure to read the rules because the pros aren't eligible to enter to win the prizes. I hate that when that happens. Along with the campaign, the PBN asks us (and YOU are included in the us) to describe our portrait of mom. And timely enough Paige just shared Hand it Over at Shutter Sisters and so I couldn't help but want to share this portrait of me as mom that my talented sister took. 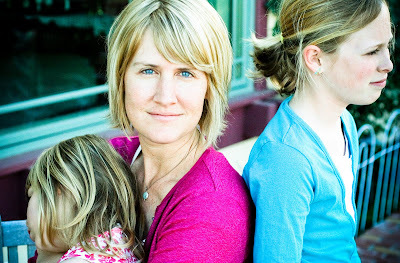 I love having portraits of my kids and I as seen by someone other than myself. I do shoot self-portraits (as you alredy know), but a view through someone elses lens is always refreshing. What makes this shot especially compelling to me is that it brings to life how I feel about being a mother. I'm in the center. I am the center. My children revolve, spin and exist around me, both in their reality and mine. Although this is changing and I already see signs of their gradual flight from our insulated, circular nest- right now, this is our life and I am still the center. And for a mother, this can as difficult as it is delightful. Being a mom means giving oneself. The hardest part for me is giving myself without losing myself. I have been vigilant (maybe to a fault at times) about holding on to me as me, beyond me as a mother. And still, now that I am a mother, they are a part of me. As I see it, they aren't separate from me but at the same time, they are. I might be talking in circles here but I have finally discovered, it isn't an either/or. It's a both. As a mother I have become a richer, fuller me and as my girls continue to grow and change and move away from me as the center, I can only hope I too grow and change gracefully, ever becoming the best me I can be, as a mother. As myself. Gorgeous photo. I totally get what you're saying. Great photo Tracey! My husband and I have been watching 3 of our nieces and nephews for 3 days and I'm getting a taste of what it's like to be the 'center' of their world and having someone rely on you for everything. And I am exhausted from it! All you mothers are saints. this is wonderful. i love getting to see through someone else's eyes too. this is a good one. and i commented on flickr but had to comment here too because you worded all those feelings exactly right. this is more than a portrait of you, it's a story of the relationships too. it's beautiful. The radius of the circle increases. But the circle around you, mom, never disappears. Hold on to that thought. I really like these thoughts. I am still trying to figure out the new me who is a mother. Your post helps me put it in perspective. Gorgeous shot, Tracey. I love how you shared this in your very special way with words. I just wanted to say that's a wonderful picture. And I completely understand what you're trying to say. Wow. I totally get what you are saying, and I love it, although I need to work on being OK to be in the center when both are fighting for my attention at the same time.